This was in January 2016, six months after Grace landed a spot in the start-up food production space CommonWealth Kitchen at the age of 16. One year later, Grace has been featured on the “NBC Nightly News,” and in People Magazine, the Boston Globe and countless other publications. Her ice cream is sold at several stores in the Boston area, and by the end of the month, will expand to 40 Whole Foods stores in the Northeast. 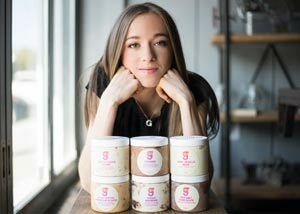 As her business grew, a backstory unfolded: Grace thought up the idea for the Little G Ice Cream Co. while recovering from surgery to remove a brain tumor at 15. Now, she brings her ice cream into hospitals to cheer up young patients. Grace always loved ice cream, but her first foray into business was a baking company. She began baking at the age of 6, and soon started taking orders from friends and family. A few years later, she started making ice cream and all its mix-ins from scratch—even the base is handmade. Sheer persistence got Grace in the door at the kitchen. After she was accepted, she navigated the bureaucratic maze of permits and plans needed for professional food production. Ice cream is highly regulated—Grace has to go through monthly lab testing for every flavor she develops. She jokes that she built her business on her iPhone, Googling examples for health code permits and other papers she had to file. As an industry, gourmet ice cream makers have branched into some unusual territory, with flavors like blue cheese, bone marrow and fennel. Grace opted for more familiar tastes, with a dozen flavors like hot chocolate and marshmallow crispy treat. Little G is a full-time business. In addition to distributing ice cream to retailers, customers can buy it anywhere in the country by ordering it online. Grace balances her job with her classes at Milton by maximizing every free moment. Grace recently appeared on the “Rachael Ray Show.” You can watch the clip here.